The idea of creativity invokes arts, crafts and design. We usually use it to describe an individual or small group of collaborators who create something with sensual impact like a musical composition, a knitted shawl or an innovative ad campaign. 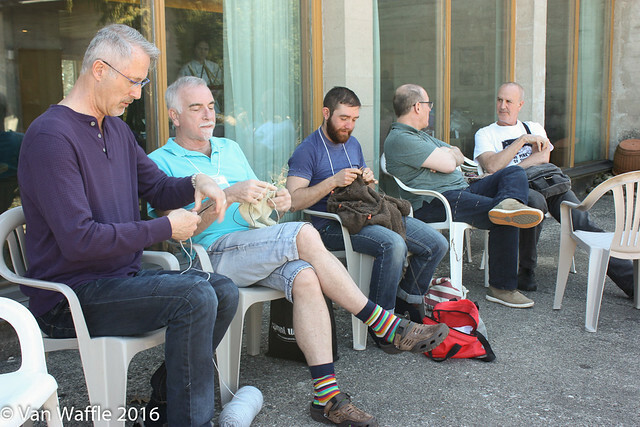 Tangible creativity blossomed during the first Canadian men’s knitting retreat, which took place this past weekend, April 15 to 17, 2016. Social interaction can manifest another kind of creativity that’s less tangible but equally rich. We often experience this when people meet. Diverse talents and ideas create an unexpected outpouring of emotion, thought and inspiration that wouldn’t happen otherwise. When conditions are right, the sum can be significantly greater than its parts. Extended time together multiplies the effect. This is why people like to hold conferences, conventions and seminars. 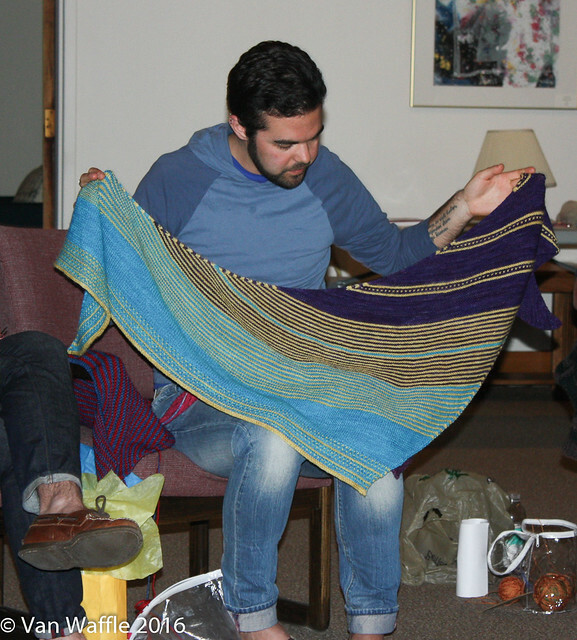 I have experienced this in a particular way with men’s knitting retreats. And yesterday (Sunday) morning, when the 19 men met for a final time, as their thoughts and impressions unfolded in our midst, I knew something remarkably good had happened. I might have known earlier in the weekend as I saw the men knitting together in the sunshine, sharing meals, embracing a friendly baby goat and gaining inspiration from workshops. But I had had a hand in organizing it this time and it’s difficult to inspect one’s own creations objectively. The feedback confirmed my belief that the retreat had impacted everyone in a positive, lasting way. Interesting fact: The 19 men in attendance included nine Ontarians, one “lapsed Canadian” from Long Island, one German and eight Americans who had traveled from as far as Florida, Texas and Colorado. Carol Lloyd’s book Creating a Life Worth Living describes the kind of creativity that involves human interaction. Certain creative types express themselves in intrinsically social ways, for example healers, teachers and directors. Lloyd calls the kind of person who organizes events a realizer. He or she relishes problem solving, provides driving energy and has good communication skills to build community. I think a realizer is also someone who senses commonalities, likes bringing people together and gets satisfaction from seeing them interact. When Jaye Crawford, Danny Ouellette and I coordinated this event, we had the benefit of advice and support from other men who had realized similar events elsewhere: Joe Wilcox of the Men’s Spring Knitting Retreat, Brady Robinder of the the Rocky Mountain Men’s Knitting Retreat and Barry VanderWeele of the Great Lakes Men’s Knitting Retreat. But the spirit of these retreats comes much more from the diversity of men who attend them. It’s like a patchwork quilt where everyone provides a square. A choice of workshops including knitting a moebius cowl, shawl design, adapting sweater patterns for personal fit and knitting toe-up socks two at a time. 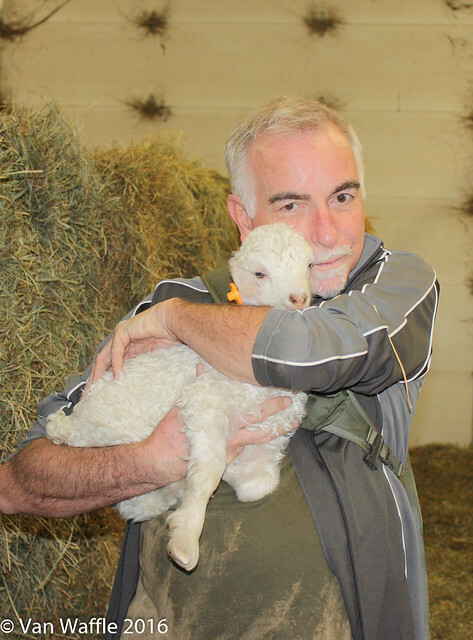 Visited Wellington Fibres goat farm, toured the spinning facility, bought a lot of gorgeous yarn and enjoyed the love of a baby kid born earlier that week. Showed off our proudest recently completed knitting projects. Raised money toward two scholarships to make our next event accessible to men with limited financial means. We did this by donating stuff from our yarn stashes to a silent auction where our friends then bid and bought the stuff. Spent a lot of time just knitting, telling tales, sharing knitting advice and gaining inspiration from one another. Sometimes, especially in the evening, the community room would fall almost silent as everyone focused on their work. It was an unusual but comfortable silence unlike anything I’ve experienced at other weekend events. The group collectively expressed great appreciation for Loyola House Retreat Centre, our accommodation. The rooms were particularly comfortable and the meals got rave reviews. As the group said its goodbyes, they left with strong support to repeat the retreat again next year. Most raised hands in support of starting a day earlier (on Thursday). So we have something bigger and better to look forward to. Loyola House has room for 30 to 50 people. We didn’t achieve the minimum, but Loyola House kindly charged us only for the number who registered. Our challenge for next year will be to get 30 registered. Based on the enthusiasm from all who attended this year, I don’t think we’ll have trouble spreading word and generating enough interest for Men’s Knitting Retreat North next time. Knowing how powerful these retreats can be, I am thrilled when someone who writes as well as you expresses the impact. Your photos enhance your words even more. Thanks for bringing the event alive…I’m sure you’ll easily enroll 30 guys next year after the success of the first event!